The state of Ohio employed about 69,390 nursing assistants, in the year 2013, providing an annual and hourly salary of $24,700 and 11.87 respectively, as per the statistics given by US Bureau of Labor Statistics. Employment per thousand jobs was recorded to be 13.54. The average CNA salary in the state was 4 % lower as compared to the average salaries all over the country. The CNA salary in OH was $23,000 as reported by indeed.com as of January 2015. 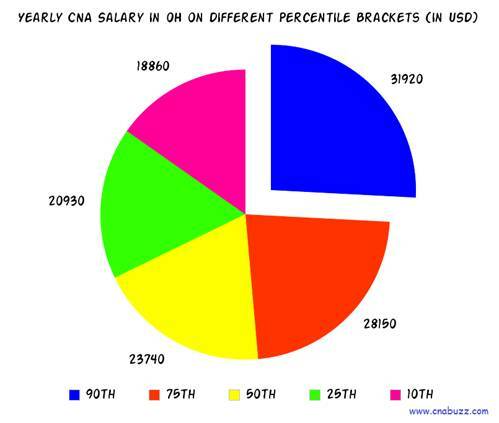 The figures shown in the table give an outline of the certified nursing assistant salary on different percentile brackets. 90% of CNAs made less than $31,920; 10% made more than $31,920. 75% of certified nurse assistants offered less than $28,150; the remaining 25% earned more than $28,150. 50% were waged less than $23,740; rest 50% salaried more than $23,740. 25% of CNAs were paid annual wages less than $20,930; 75% were paid more than $20,930. 10% of employees were offered less than $18,860; 90% were offered more than $18,860. The income of a certified nursing assistant can be affected by a number of aspects, which includes the education level of nurse and the working location. 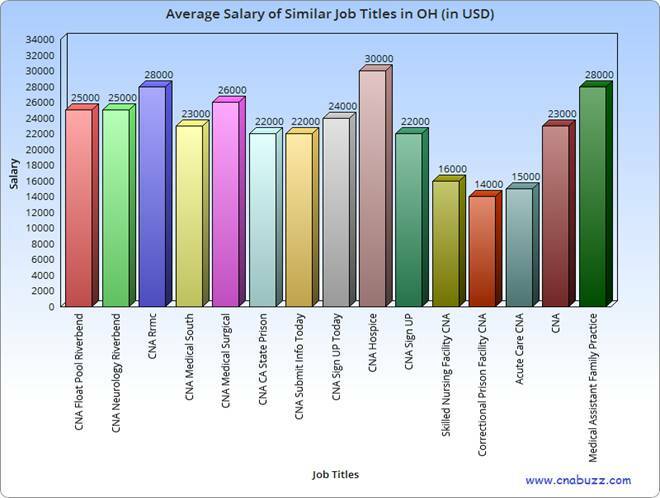 As per the data provided by salary.com, Cleveland and Euclid offered the highest payment to the CNAs. The median annual and monthly salaries in these cities were $30,634 and $2,553 as of Jan 2015. Portsmouth paid very less ($27,745). With the increasing demand of certified nursing assistants, they are offered hefty packages. Thus, the salary of a CNA may vary according to the designation. In Ohio, CNA Hospice was paid the highest salary, i.e. $30,000 while Correctional Prison Facility CNA comes under lowest salaried professionals with an income of $14,000. The other professionals were paid between $15,000 and $28,000. The BLS expects the job growth of certified nursing assistants to rise by 21 percent in the coming years. The growing rates of numerous chronic ailments will certainly increase their demand. In addition, CNAs will also be needed to take care of the elderly patients in various nursing homes. The demand may only be constrained by the fact that a number of nursing homes are still dependent on the government funding. Question 1 – What hourly salary can I expect in the state of Ohio? Answer – The hourly salary in the state ranges from $13 to $15 in the various cities of Ohio. Question 2 – Can anyone tell me some top paid job titles in OH? Answer – In Ohio, CNA Hospice is the highest paid job title with an annual salary of $30,000. Other job titles are CNA Rrmc ($28,000), CNA Medical Surgical ($26,000), and Medical Assistant Family Practice ($28,000).